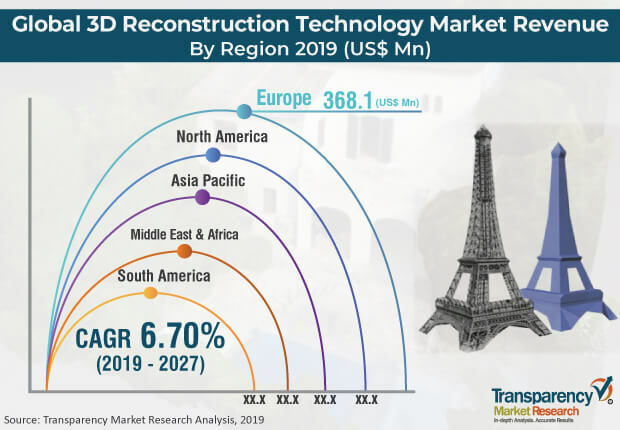 According to a new market report published by Transparency Market Research,the global 3D reconstruction technology market was valued at US$ 778.4 Mn in 2017 and is expected to expand at a CAGR of 6.7% from 2019 to 2027, reaching US$1,432.6 Mn by the end of the forecast period. According to the report, Europe was the largest contributor in terms of revenue to the 3D reconstruction technology market in 2017. The driving factor for the 3D reconstruction technology market is rising focus of governments on preservation of cultural heritage. Cultural heritage is the keystone of history. Cultural heritage is important for the creation of a common identity as well as for social and economic development. Digital technologies and the internet bring unique opportunities to access cultural material for leisure, study, or work, reaching out to broader audiences, engaging in new user experiences and reusing it to develop learning and educational content, documentaries, tourism applications, games, and other innovative applications. To achieve this, governments have taken initiatives to reconstruct images or videos in 3D models. For instance, in December 2012, the online platform Europeana announced plans to convert one million historical images into digital form. In May 2017, Europeana.eu, a digital platform for cultural heritage based in Netherlands presented Europeana Photography, an online collection bringing together and sharing a vast archive of historical images. Europeana Photography has presented images from the first 100 years of photography, sourced from photographic archives, agencies, and museum collections across Europe. The global market for 3D reconstruction technology is segmented on the basis of type, construction type, application, industry, and region. The market is categorized based on type into 3D reconstruction software; based on images and video; and based on 3D scanning. In terms of construction type, the market can be classified into active and passive. The passive reconstruction type is estimated to account for the highest market share in 2019. However, active construction type is expected to expand at the high CAGR as it offers accurate and real time data type. The market can be divided based on application into civil engineering, product design & development, public safety & forensics, medical, gaming & entertainment, mapping & surveying, and archeology & documentation. In terms of industry, the market is segmented into industrial manufacturing, healthcare, media & entertainment, agriculture, government & public safety, oil & gas, marine, infrastructure & construction, energy, museum & heritage, and aerospace. Industrial manufacturing is further categorized into robot manufacturing, heavy equipment, and automotive. Infrastructure & construction is categorized into bridges, dams, and tunnels.The industrial manufacturing industry is expected to gain significant impact over the forecast period. In manufacturing industry, 3D reconstruction is used for product development and design, vehicle crush measurement etc. Geographically, the global 3D reconstruction technology market is bifurcated into North America, Asia Pacific, Europe, South America, and Middle East & Africa. Europe dominates the 3D reconstruction technology market. This is due to rising focus of governments on preserving cultural heritage. In North America, the U.S. is a major revenue contributor due to the presence of companies such as Autodesk, Bentley Systems, Adobe Inc., and 3D Systems. In Asia Pacific region, demand for 3D reconstruction technology is driven by the booming entertainment industry along with the surging demand for mobile mapping systems. In Middle East & Africa, demand for the 3D reconstruction technology is due to the well established building and construction industry as 3D reconstruction technology helps ineffective designing. Major industry players in the 3D reconstruction technology market are adopting different strategic initiatives such as partnerships and collaborations for technologies and new product development. The global 3D reconstruction technology market includes key players such as PhotoModeler Technologies, Agisoft LLC, Skyline Software Systems Inc., omicX, 3DHISTECHLtd., All3DP GmbH, Photometrix, Autodesk, Inc., Adobe Inc., 3D Systems, Intel Corporation and others.